The fuel system on the marine diesel engine needs periodic attention. In the older mechanical fuel injection diesel motors, the injectors require service at specific intervals. Typically 1000 hours of operation or two years are the service interval for a turbocharged propulsion diesel. At a certain point, so much diesel fuel has passed through the injector that injector tip hole elongation or reshaping occurs. When this happens, the atomization is unequal between the partner holes in the injector tip causing additional smoke emissions and accelerated wear in the cylinders. 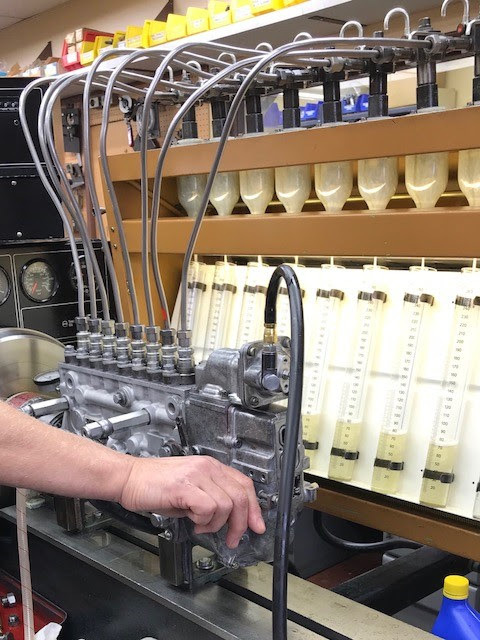 The use of fuel additives has been proven to help extend injector life by adding lubricity and cleaning agents to reduce tip “coking.” Even so, the injectors must receive periodic service to assure they all work correctly and allow each cylinder to contribute the same power level. One bad injector can damage an engine cylinder in extreme cases. The newer technology in diesel engines uses Common Rail fuel injection. Through the use of electronic equipment, the air-fuel ratio is more controlled in the Common Rail engine. With this new technology, the fuel system is so advanced that the computer is continually fine-tuning the manner in which the engine is running. The injector technology involved has been a great leap forward in regards to materials, machining tolerances and reliability. They are so good that the engine manufacturers don't specify maintenance according to an hourly interval. This significant achievement has drastically reduced the cost of service over the life of Common Rail types of diesel engines. Keep up with your maintenance and keep on boating!